Appearance: bud, buds, buds only, 100% tip. Golden color, fuzzy soft buds. 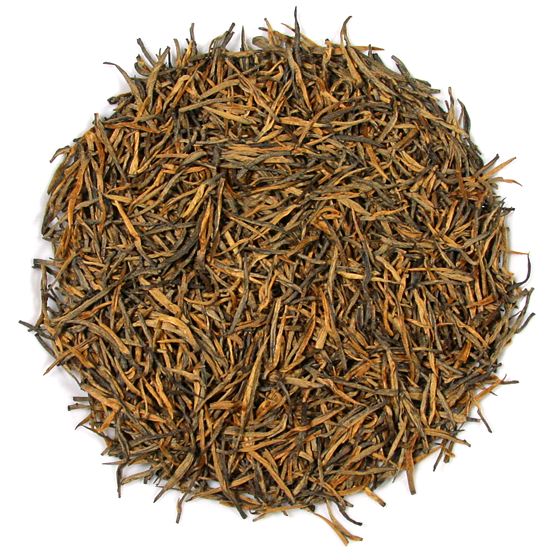 Yunnan Jumbo Golden Tips is also delicious cold, and can be re-steeped numerous times, which is great for yielding the quantity that is needed for iced tea. It will also tolerate a long steep if you choose to do that and then dilute it for drinking hot or cold. It is a bulky tea, so be sure to use enough – and re-steep! This unusual-looking, golden-colored tea is utterly captivating and delicious. 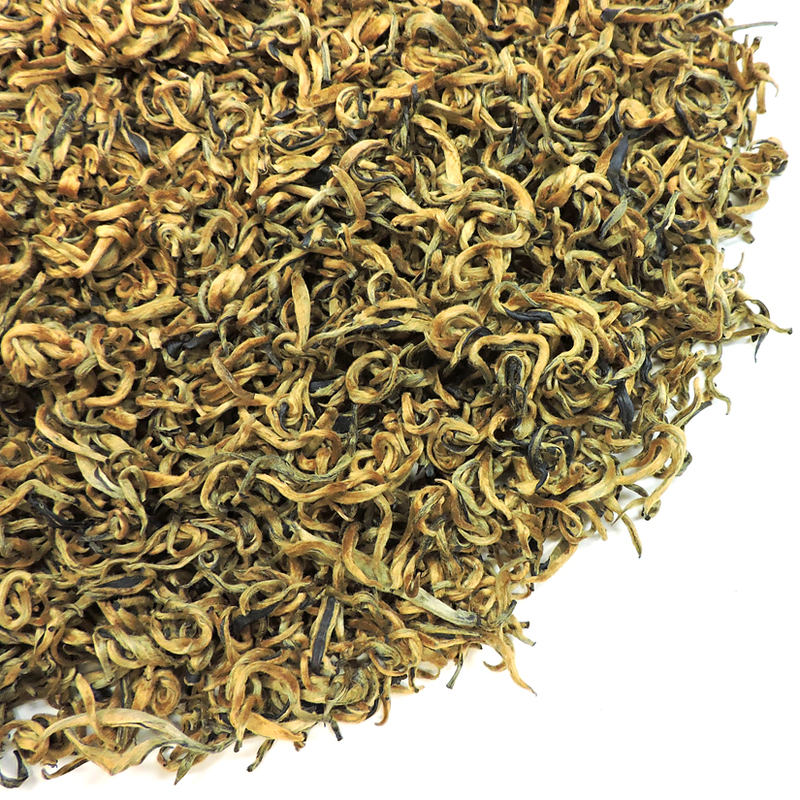 Jumbo Golden Buds is one of our extremely rich-tasting Yunnan dian hong selections – it has a wonderfully balanced structure that is creamy and smooth and sweet while being very mouth-filling and satisfying at the same time. It is comprised 100% of soft, sweet, tender tea buds. The buds are graceful and sturdy – rightly inheriting their descriptor: jumbo. Big, plump and beautiful, these buds have the golden tan/yellow color that is the hallmark of Yunnan buds that are plucked from broad-leaf Yunnan arbor tea trees in remote, high mountain forested locales. The particular lot that we are offering now, an autumnal pluck, is slightly more curled than some of the Jumbo Golden Buds that we have had in years past, and the taste is exquisite! This current style is actually very similar to the tea we tasted when we first fell in love with this tea more than 25 years ago. Try this tea without milk and you may find that it is just perfect enjoyed that way. It is also delicious cold, and can be re-steeped numerous times, which is great for yielding the quantity that is needed for iced tea. 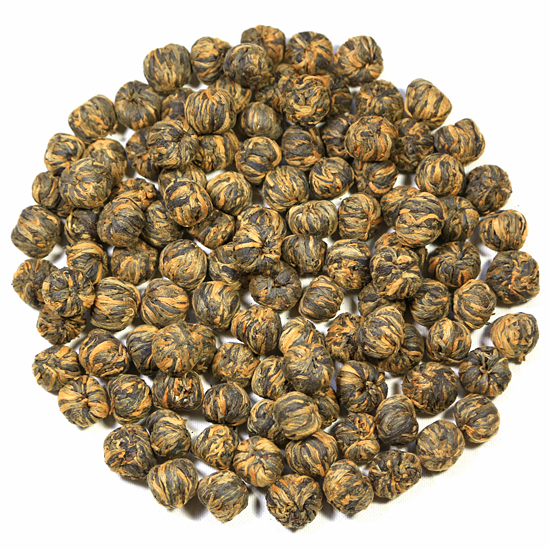 Yunnan Jumbo Golden Buds will also tolerate a long steep if you choose to do that and then dilute it for drinking hot or cold. 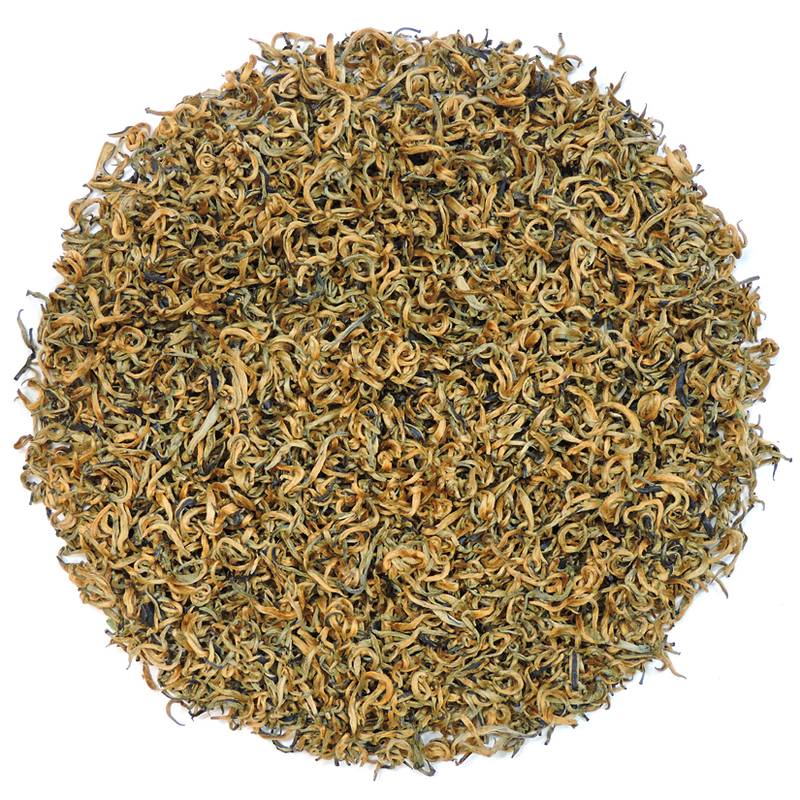 This tea is grown and carefully crafted in the Simao Tea Harvesting area. Yunnan has a long history of producing both Pu-erh and dian hong made from forest-gathered leaf materials. We love dian hong such as this tea – a traditional, small village made tea that is not like any other small village made tea due to the wonder of terroir.